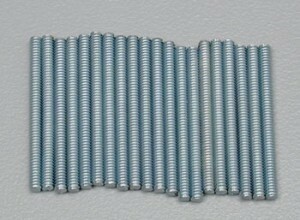 4-40 x 48" Threaded Push Rods (1 pushrod per item ordered) Image is short 4-40 rods for example only. 2 each 4", 6", 8", 10" and 12". 10 rods in all. Saves time having stock rods ready to go. Good variety pack to keep on hand. Fully threaded 4-40 steel rod. 12" Length. .093 diameter. Formable. 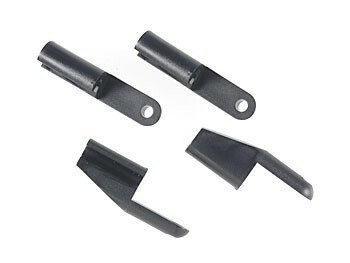 Easily snaps over simple L bends to retain your push-rod end in servo or control surface horn. 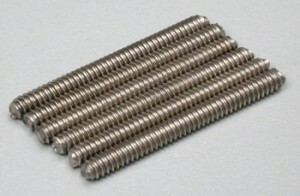 For .093 (2.5mm) wire size. .093 (2.5mm) is the diameter of the smooth portions of 4-40 push-rods. Single 4-40 x 12" Threaded Push Rod. Single 4-40 x 30" Threaded Push Rod. Machined out of steel for maximum strength. Thread length is 5/8 (15.8mm) long with an overall length of 1 1/2". Nickel plated for easy soldering. Use to put threads on the end of your own custom rods. Solder on to metal pushrods or glue to carbon rod. Fits onto any 2.4mm (.095) rod. Threaded for 4-40 rod ends. 2 per package.